Belgium's Thomas Pieters scored the winning point as Europe produced a dominant display in the Singles matches to win the 2018 EurAsia Cup presented by DRB-HICOM. Thomas Bjørn's visitors began the day one point behind Asia but won seven of their first eight matches on Sunday to successfully complete the defence of their crown with several matches still out on course at Glenmarie Golf and Country Club. Europe ran out 14-10 winners after securing eight victories in the Singles session, with Asia managing just three wins and the other match finishing all square. Ryder Cup star Pieters made a blistering start against Byeong Hun An, winning four of the first six holes without reply to establish a healthy lead. But the South Korean bounced back in style and took the eighth, ninth, 12th and 14th to level the match. Pieters then curled in his tricky seven-foot putt at the 15th to regain the lead, before winning another hole at the next to ensure Europe would retain the trophy at very least. After An had holed his birdie putt at the 17th, the final hole was halved in fours and Pieters could celebrate delivering the winning point. Alex Noren set the ball rolling for Europe, beating Nicholas Fung 4&2 in the lead match to level the tournament at 6½-6½. 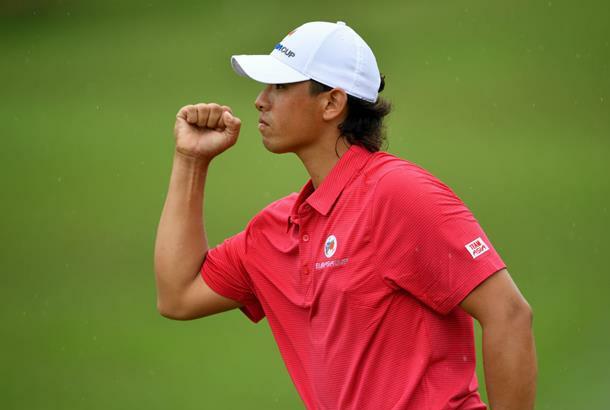 Rafa Cabrera Bello then beat Gavin Green 4&3 before Race to Dubai champion Tommy Fleetwood made it three in a row with a 2&1 victory against S.S.P Chawrasia. Poom Saksansin got Asia's first point of the day when he beat Paul Casey by one hole but Henrik Stenson soon put another blue point on the board, beating Hideto Tanihara 2&1. Englishman Tyrrell Hatton then beat Anirban Lahiri 2&1 before Matthew Fitzpatrick halved his match against Sunghoon Kang. Asia won the final two matches, with Li Haotong and Yuta Ikeda beating Paul Dunne and Ross Fisher respectively, but the day belonged to Bjørn's men in blue who once again take the trophy back to Europe. Thomas Bjørn, Captain of Team Europe, said: "It was a great performance today from every single one of them, they came off the golf course yesterday and there was a determination and a will of wanting to win this. "To then go out and do the job the way they did today shows a lot about the character of these 12 guys and it shows a lot about the character of European golf and it shows a lot about what we are. I think that's what I take away from this week, 12 great guys, 12 guys that wants to go places in the game of golf. "To sit on the sidelines and watch them do what they do best has been a tremendous pleasure. It's been wonderful to see and I learned a lot about myself and about these 12 players this week, and today their performance was outstanding. "It's an emotional roller coaster ride for three days. You live every shot with your players and you are missing putts, holing putts, winning holes, losing holes. You live every moment out there and you've got an idea of what all 12 are doing. When you're a player, you play your own golf and concentrate on what's right in front of you. "These kind of events always become closer than you think sometimes, and that's always good to know. When you go out there as a team, you've got to play. You play for very few points the first two days and then you play for a lot of points on Sunday, and that's the way these events are. It can swing very much on the last day and we showed today that if you are good and strong on Sundays, you can win these things."